When you create beats on Roc or edit mashups in Myna, you probably want to share them with your friends across the Internet. You may have noticed that since last year, we've integrated SoundCloud to offer you even more awesome features. Today, we've taken it a step further. Now, SoundCloud is offering Aviary users 15% off (woot!) for premium SoundCloud accounts. What does a premium SoundCloud account get you? For starters, it lets you upload from 4 hours of music (900 Roc creations!) to unlimited music, and it gives you extra control over your privacy settings. It also gives you new widgets to share your music and unlimited downloads. See their premium account comparison page for more details. We've made it super easy to share your tracks on SoundCloud. You can publish your Roc and Myna songs straight to SoundCloud by checking the box during the save process. Just make sure you add your creations to our public SoundCloud group, Created with Aviary Apps. Just click the 'Share a Track' button on our group page! This group will showcase your creativity to the musical community, and it will allow other users to do awesome things like insert comments at specific parts of your track and get updates on your new creations. Side note: Roc and Myna have also been added to Soundcloud's App Gallery! To stay updated on all our latest happenings, follow us on Twitter, Facebook, or Subscribe to our blog. Thrilled by the possibilities of Smart Layers in our online image editors, which we've been covering over the past couple weeks? Get ready to be even happier. Our online audio editor, Myna, has Smart Layers too! Though this functionality isn't exactly a layer, it works very similarly to the Smart Layers in the graphic editing applications. Myna has a function that will let you create and edit beats from our Music creator Roc from within the audio editor, so there's no need to open a new window to create beats for your mix. It's very easy to make a Roc beat to add to your mix: just start by pressing the Beat button (the one nicely marked with a "New" banner). This will open the familiar Roc interface directly in Myna. Now you can create your beat just as you would in the standalone version of Roc. When you're done and want to add the beat to your mix, press the "Add Beat to Myna" button. You'll be prompted to save the beat before it adds it into the mix. You can also edit preexisting beats that you've added to Myna by right-clicking on them and choosing the "Edit Clip in Roc" option. You will be warned if you try to add a Roc beat where a clip is already located. Just move the playhead to an empty location to continue. Change the tempo with the traditional dragging method, or with the new arrows for more precise results. We've also updated the standalone version of Roc with some features that previously were only available in the version within Myna: shorter sound names, instrument names on each track, and a collapsible sidebar. Enjoy all the new functionalities of Roc-in-Myna, plus copy and paste effects from one clip to another (a much-requested improvement). You can access this new feature from the context menu. You can now save path filters. Phew! Added path operations: union, subtract, difference and invert. You can find these under the menu "Path operations." To use them, you must have 2 path objects selected. To try these new features out, just launch any of our apps and get to it! As always, if you can’t wait to see the next wave of features, feel free to try them out before they're officially released by signing up at www.aviary.com/alphatester. We love your feedback - whether it's an exclamation of joy or a suggestion for how we could do better. Let us know what you think of these new features!! Many of you probably have seen and played with the Randomize All Beats function in our online music creator, Roc. It's good for getting started when you're not sure what you want to create, but it can be a bit chaotic with so many random beats. An easier to manage Randomization feature can be found in the track option menu. 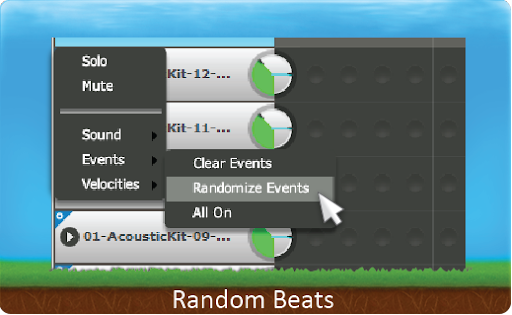 Choose Events>Randomize Events to only add beats to that individual track. It's a great way to get inspiration for the rest of your beats! music creator (codenamed Roc). Aviary's music creator turns anyone into a musician with a few simple clicks. Now anyone can create music and beats completely from scratch and right in their browser, by simulating almost 50 different instruments, ranging from common instruments like various drums, pianos and guitars to orchestral instruments like harps and flutes to more obscure (but fun!) 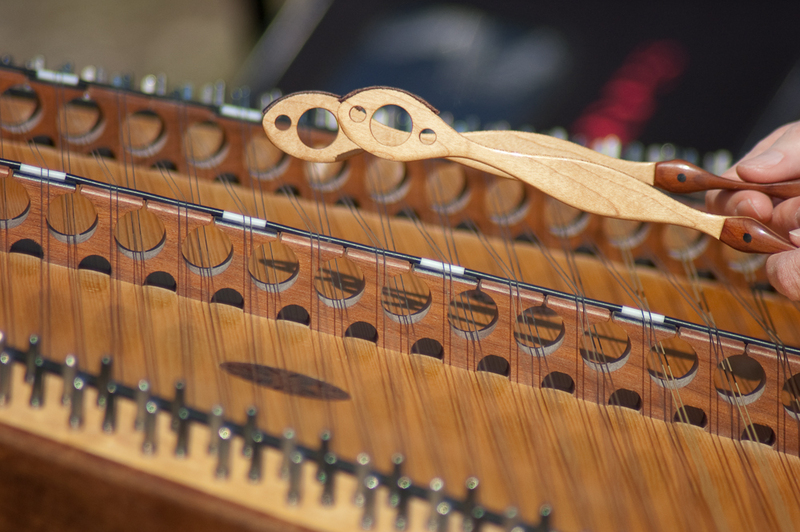 instruments you may never have heard of like the balarimba and hammered dulcimer. We spent the time carefully recording and toning each instrument so that you have a ton of variety to choose from. We opted to provide a simple point-and-click grid interface instead of requiring people to know musical notation, feeling that a point and click interface would be easier and more fun for most people to use and learn. Aviary's Music Creator is incredibly simple and yet is also full featured, allowing more advanced users to mix and match any instruments - and even record your voice or upload your own custom sounds. Best of all, completed music made using our instrument library can be used by anyone for any purpose, commercial or non-commercial. We spent considerable time and money developing this library ourselves and have decided to give back to the community by releasing use of mixed sounds from our library under a Creative Commons - Attribution 3.0 Generic license. We feel that by providing this tool without any commercial restrictions we will help the Internet cultivate and create an alternative shared library of musical loops that anyone can access and use without restriction. For Aviary users specifically, this means that you will now have additional custom options beyond the thousands of professional tracks in the Quantum Tracks library that APM Music already generously provides in our audio editor, that may not be used commercially. You can download any of the music loops you create in our new Music Creator as MP3's. You can use them directly in Aviary's online Audio Editor app as part of a larger sequence or even just to make your own custom ring tones! Create some loops and share them with your friends - you can even use Aviary to assemble an entire song made by all of your friends together. HipHop Seq 6.egg on Aviary. We are adding new instruments and sound-groups all the time and will be allowing Aviary users to add their own instruments as well. Next up will be a collection of human vocals, so you can create your very own human beatbox! And for those of you who were excited enough to read through to the bottom, we even made some of our experimental advanced beta features available right at launch (but you'll need to unlock them first by inviting 5 friends)! * Control the "velocity" of beats (i.e. how soft individual beats are played). I can't wait to see what kind of music you can all create. And a huge props to Alan Queen, Akshara Weave and the Aviary team for creating such a versatile and magical tool. Now what are you waiting for? Go make some music!